The good folks at Exterro recently released a very interesting report titled “Federal Judges Survey, eDiscovery Best Practices and Trends.” The title includes a link to download the report, which I highly recommend reading as it is good to know what the judges who rule on eDiscovery all the time are thinking. Overall, the report calls for some necessary disruptive change in the practice of eDiscovery in order to demonstrate competency. There are some excellent tips in the report on how eDiscovery professionals can improve and what kinds of trends we should be on the lookout for. 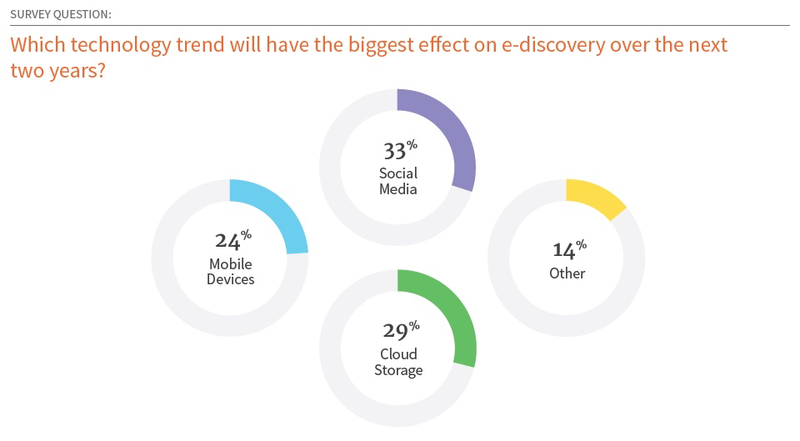 One finding stood out to me in particular – the Judges surveyed felt that social media would be the technology trend with the biggest effect on eDiscovery over the next two years. As the report states, “Attorneys must be aware that all emerging technology platforms are just like email; if they hold relevant evidence you are accountable for preserving the data.” At X1, we’ve known this for quite some time. We’ve blogged about cases where the old way of doing social discovery – print screen – has been shown to lack authenticity standards and not meet the duty of competency that lawyers must meet. To see the Judges recognize this as a critical trend rather than just a niche corner of the market validates what we have known for years. The ability to keep data forensically sound. This requires calculating MD5 hash values of individual items upon capture and maintaining those values through export. The platform must keeps logs and reports of all actions on data. It also must be able to use metadata to establish chain of custody and authentication. 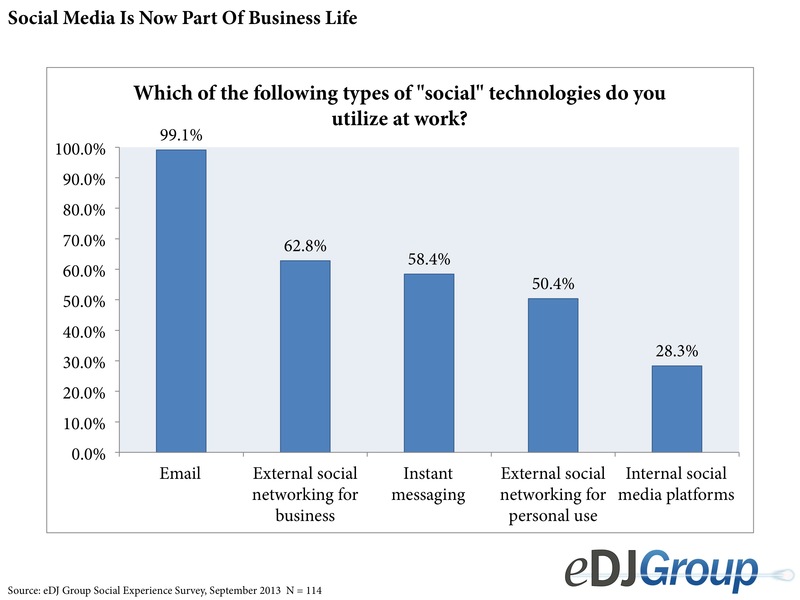 The challenge with social media – unlike email – is that much of the data resides outside the walls of an organization. Collection of social media becomes a challenge. Companies cannot simply call Facebook or Twitter and request all of the information for various custodians. It is possible to take screenshots of various web pages or social media sites, but as case law points out, screenshots are not necessarily admissible as evidence. Plus, screenshots take a technical toll on eDiscovery – they can be difficult to index and may require OCR, which still may not be able to pull text out of the image. That is where an investigative platform like X1 Social Discovery is so important to a competent eDiscovery practice. Unfortunately, a tragic event transpired this morning in Las Vegas leaving three people dead and at least three others injured after a shooting and fiery six-vehicle crash along the Strip. According to reports, at about 4:20 a.m. someone in an SUV opened fire into a Maserati that had stopped at a light. The Maserati moved into the intersection at Flamingo Road and collided with a taxi, starting a chain of crashes that involved four other vehicles. Our thoughts and prayers are with the victims and their families. 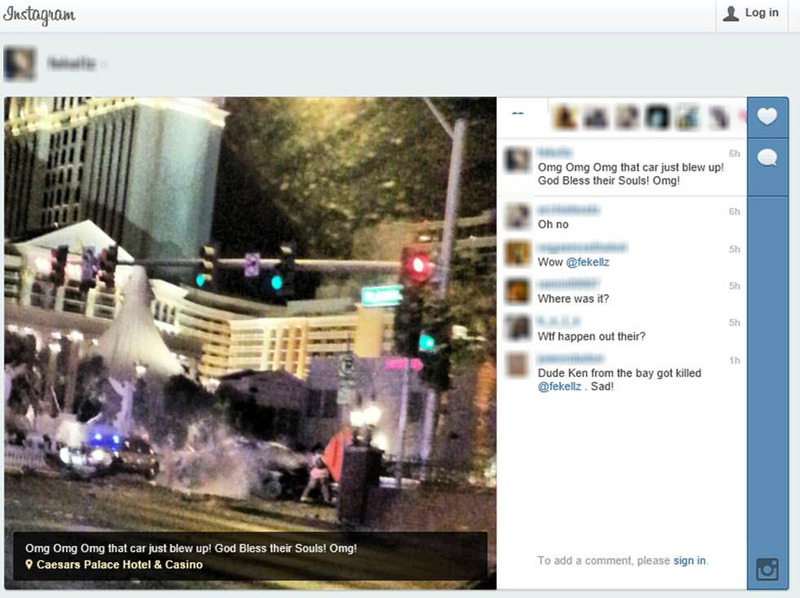 Given the criminal investigation and civil liability implications of this event, we wanted to demonstrate the new important capabilities of X1 Social Discovery to immediately identify, preserve and display geolocated Tweets (and often Instagram posts) at or near the scene immediately before, during and after the incident. X1 Social Discovery is now able to map a given location, such as a city block or even a full metropolitan area, and search the entire public Twitter feed to identify any geolocated tweets that have been made in the past three days (sometimes longer) within that designated area, as well as to capture any new tweets within that area going forward. As illustrated below, this capability is extremely useful for law enforcement, corporate security and civil litigators. 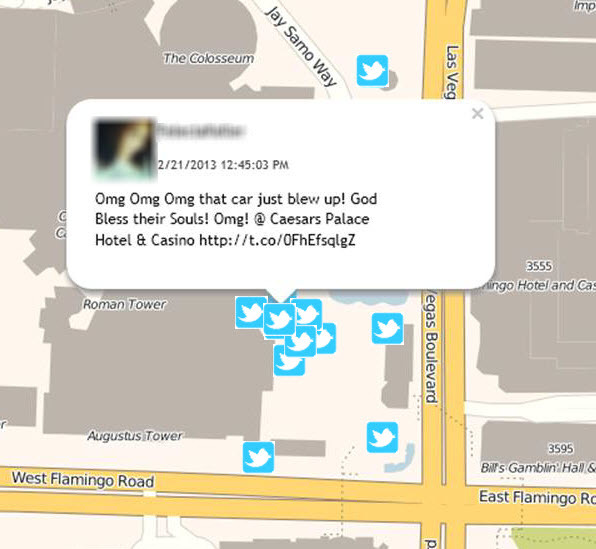 When we learned of the Vegas incident, we mapped the general area of the strip and within seconds, all the recent Tweets from the past several hours were populated within the grid and collected within X1 Social Discovery. 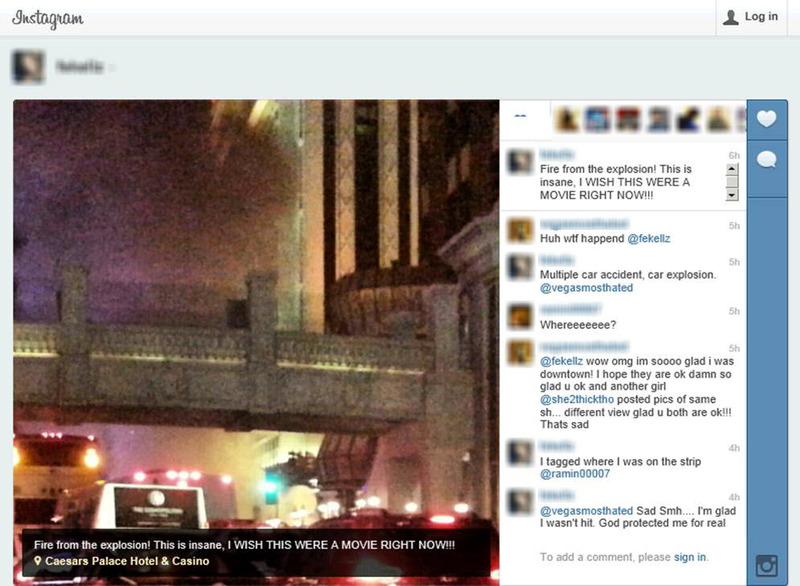 We are able to sort and identity the exact time (in GMT) of the posts in question as well as associated metadata. Here is another post below. Both this example and the one above contain notable intel in the comments, suggesting the possible identity of one of the victims, as well as a reference to another posted picture on Instagram. This reflects the utility of X1 Social Discovery’s ability to collect not just the social media post, but the comments thereto in real-time. 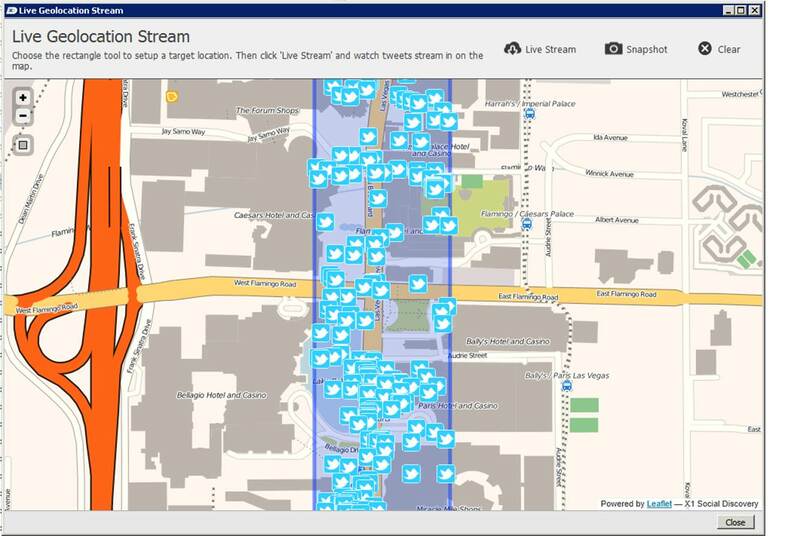 This feature can also be employed proactively, to map an area around a school, an embassy, an oil drilling facility overseas, or other critical infrastructure assets to collect and store any geolocated tweets in real time. But of course in order to take full advantage of this ability to gather key evidence such as the evidence, posted above, you need to own the software at the time of the incident.